It has been more than 50 years since the Supreme Court ruled in Engel v. Vitale (1962) that school-sponsored prayer in public schools violates the Establishment Clause of the First Amendment, and more than 20 years since the high court decided in Lee v. Weisman (1992) that public schools may not sponsor or promote prayer at graduation ceremonies. But as the incident in South Carolina illustrates, the controversy over prayer in school has not diminished. A majority of Americans disapprove of the Supreme Court’s stance on prayer in public schools, according to 2012 data from the General Social Survey, conducted by the National Opinion Research Center at the University of Chicago. Asked whether they approve or disapprove of the court’s ruling that no state or local government may require the reading of the Lord’s Prayer or Bible verses in public schools, roughly 39% say they approve and about 57% say they disapprove. Those percentages have stayed relatively steady since the early 1980s. Costner’s fellow Southerners are among the strongest critics of the Supreme Court’s rulings on school prayer. More than seven-in-ten people (73%) living in the South say they disapprove of the high court’s decisions on the topic in the 2012 GSS. But many in Costner’s generation have a different view. Nationwide, about 56% of those ages 18-29 say they approve of the ban on school prayer – by far the highest share of any age group. 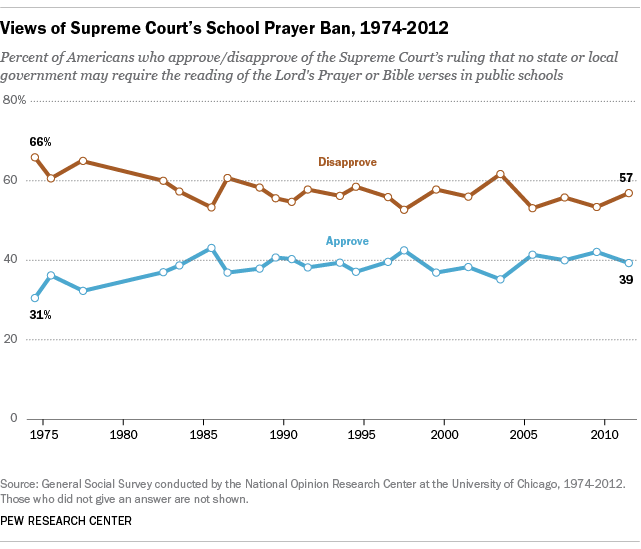 Americans are well-informed about the Supreme Court’s rulings on school prayer. Of the 41 questions that Pew Research asked in its 2010 Religious Knowledge Survey, the single question the largest number of people got right is whether the Supreme Court rulings allow teachers to lead public school classes in prayer. Nearly nine-in-ten respondents (89%) correctly answered that this is not allowed. But the survey also found that many people think constitutional restrictions on religion in public schools are stricter than they really are. Only 36% of the respondents to the survey knew that public school teachers are allowed to teach comparative religion courses, and just 23% were aware that teachers can read from the Bible as an example of literature.